Whoever coined the phrase, “Monkey see, monkey do” must have spent a lot of time around small kids. Even though I don’t remember copying my parents when I was a wee one because most of my pre-NKOTB memories have been blotted out*, I know that it must’ve happened because my own kid wants everything that I even hint at liking. My beloved cup of coffee this morning was hijacked when she grabbed it and deposited a tennis ball in it. I don’t know what’s worse: that she drank a little of my high-octane brew or that she got a mouthful of tennis ball that we found adjacent to a garbage can at the park. *The image of Donnie Wahlberg in shredded jeans will do that to the brain. So it was with great fanfare that a package from Kerry’s shop The Tragic Whale arrived at our home recently, for it contained goodies for me and my Wee Cee. Goodies we could keep separate. I was in need of a small handbag that I could carry all my essentials (ie, ID, phone, keys, debit card, hand sanitizer, extra pacifiers) around in, but I knew that once my new bag arrived, Cee would become fixated on it and hijack it for her own. Wouldn’t you? It’s adorable! Look at those sad little frogs. They’re not really sad. Just flip them over and they’re smiling! So I did what any good mother who wants to be left alone for five minutes loves her child does: I got Cee her own purse too, one with gnomes all over it. 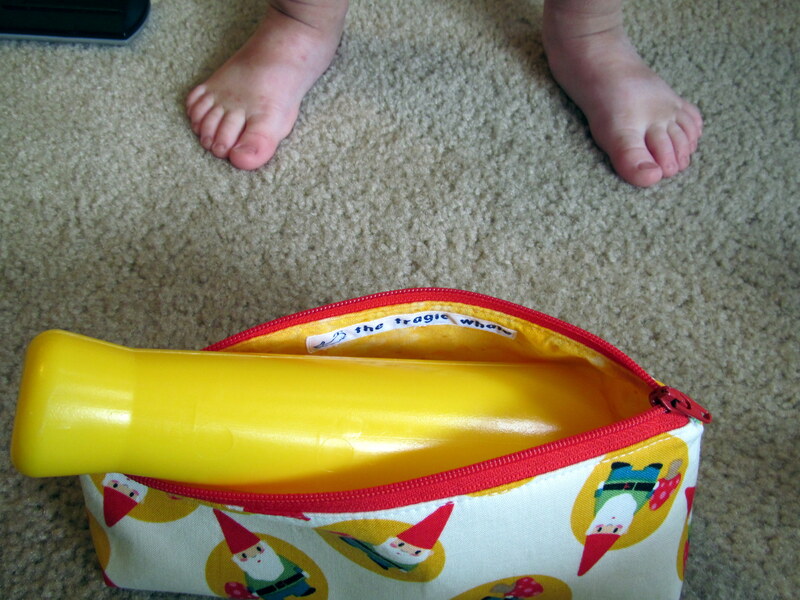 Well, not a purse per se: it’s technically a pencil case, but she found many, many things to put in it. Like her keys. And her phone. And her plastic Oscar the Grouch. Y’know, the essentials. It also fits a random plastic post that goes with those Fischer-Price ring toys. 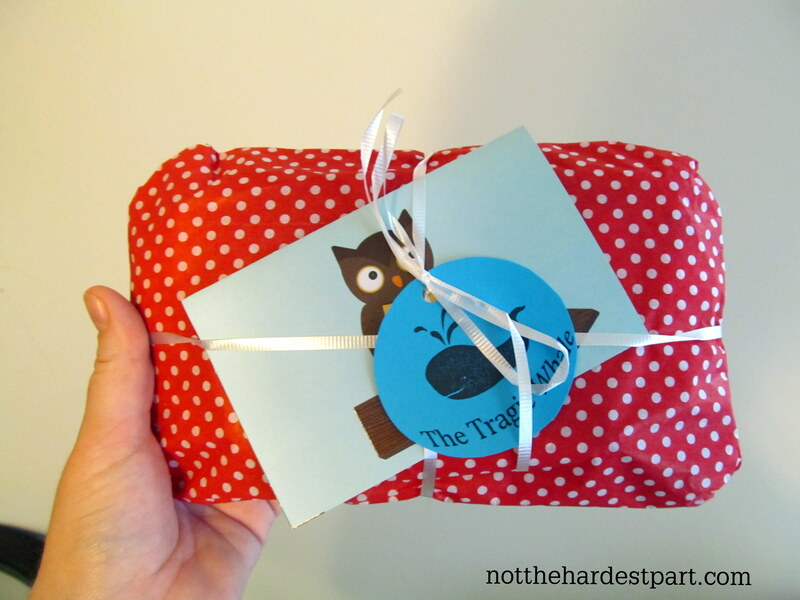 There’s a lot to love about all the wares of The Tragic Whale. 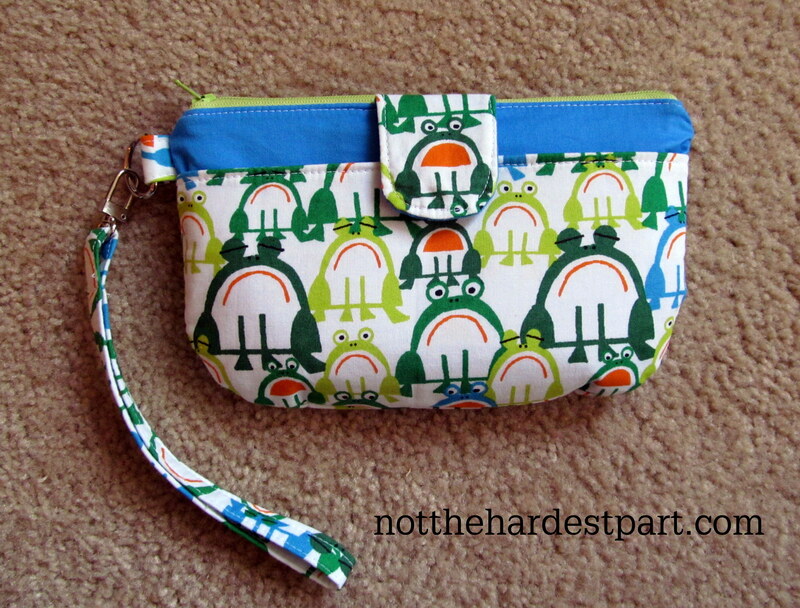 Kerry makes everything in her store (clutches, pencil bags, coin purses, makeup bags, etc.) and that includes her patterns. She only creates functional products that she would use herself. In fact, all of her products were born out of necessity of things that she needed. Many of her pieces are made from organic cotton, and each piece is 100% one-of-a-kind and made to withstand toddlers and accident-prone adults alike. Try your worst: just toss ’em in the wash and they’re good to go! 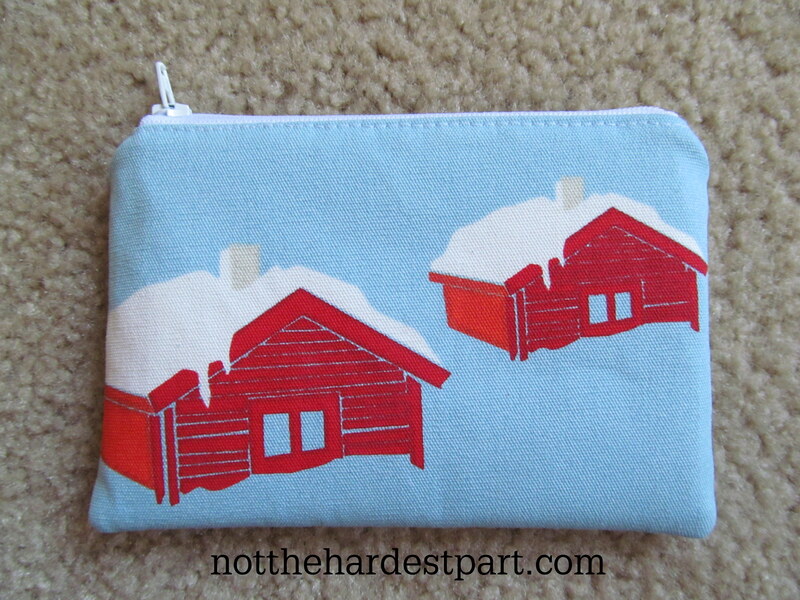 All coin purses should have little snow-covered cabins on them. OBVS. This week, Kerry is going to be offering readers of The Waiting an awesome deal. Just enter the code TheWaiting15 at checkout and you will receive 15% off your purchase! I love what your daughter chose to put in her gnome-covered pencil pouch. She obviously has her priorities straight. What a cutie! She absolutely does ;D Thanks! Those purses are very cute. I agree! You’ll love them. If I could get ALL her stuff for Christmas, I may be the happiest person EVER. And this is a VERY good one! Good luck! That’s some cute stuff, right there. You will really love them. They are extremely high-quality too. I’m a sucker for tiny purses/pencil cases. I’m off to enter this giveaway. Woooooooot. Which one would go well with this outfit? I wouldn’t put it past Kerry to find some organic Star Wars prints. I might be convince to carry a purse in that instance. Ohhhh! I hope I win I hope I win I hope I win! Thanks, you awesome ladies! Fun! I always love your giveaways Em! The products are such good quality! I mean, I’m assuming so because the giveaway that I won was awesome, so I assume that same standard holds up to every giveaway that The Waiting does. No crap on this blog, no sir. Thanks, Lils! Be sure to enter this one because it is incredible. You will love Kerry’s stuff. It’s a good thing C and I have very similar taste ;D Thanks, Brig! Love these adorable bags! What a great giveaway! 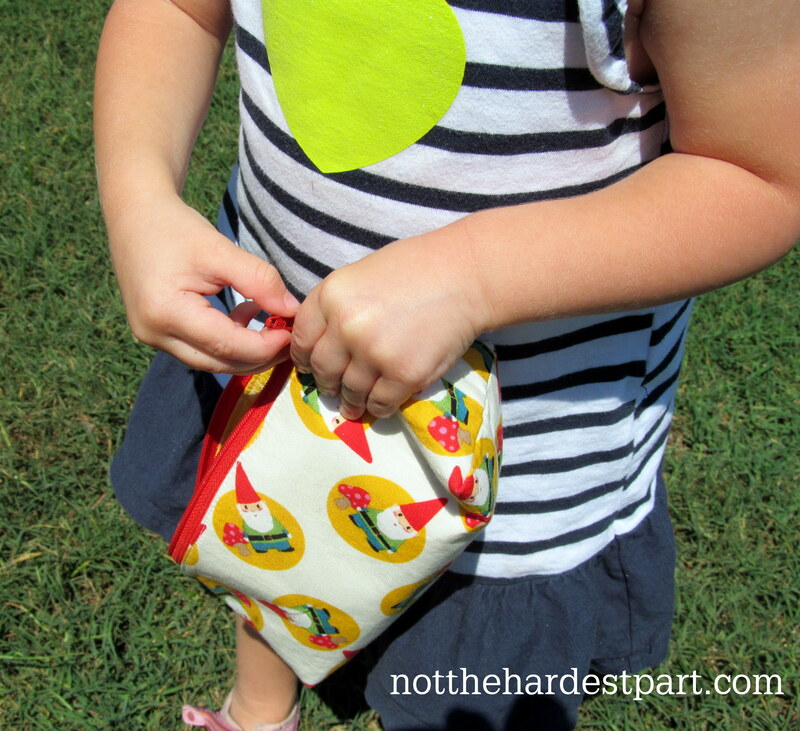 Love these adorable bags! Thanks for the great giveaway! ← Remember the Time…we had picture day?